Serving Church, Community and Corporate Clients across the USA since 1987. AcousTech provides a full range of services in the fields of Audio, Video, and Lighting systems design and installation, as well as Acoustical Consulting and Design for new and existing facilities. We have been privileged to serve over 750 churches, community and corporate clients since our inception. It has always been our philosophy to design and install with components and materials that meet or exceed the functional requirements of each system through an optimal balance of cost, performance, and reliability. Likewise, in our acoustical consulting and design services, we avoid specifying costly, esoteric materials or methods whenever possible. We believe it is not reasonable or fiscally responsible to specify components, materials or methods where a small “perceived” improvement is accompanied by a disproportionate increase in cost. You can expect creative ingenuity, integrity, and professionalism, combined with extensive experience in every aspect of our services, from project conception to completion, followed with ongoing service and support. 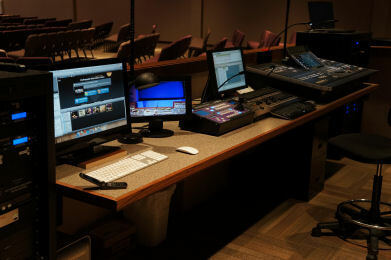 Recognizing the diversity of worship styles among churches, our combination of expertise in all areas of Church Audio, Video, and Lighting Systems, Acoustical Design/Engineering, Theater Technologies, Broadcast and Recording Production and Music/Theater Performance allows us to cater to the individual needs of each client. From smaller neighborhood churches to multi-thousand seat worship spaces with full production capabilities, we combine established principles of acoustics with cutting edge audio, video and lighting technologies. Our extensive experience in design as well as practical application and operation provide the blend of science and art necessary to achieve superior results. 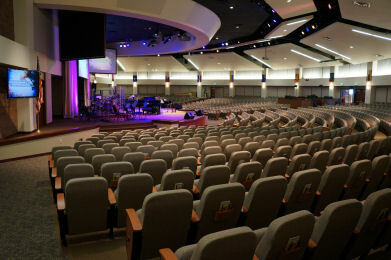 From wedding and event venues to retirement community centers and multi-purpose spaces, from gymnasiums and community auditoriums to office building audio/video or sound-masking systems, to the delicate system needs of funeral homes, AcousTech handles each design and installation with professionalism and excellence.